It may be the opening salvo of the 2016 Republican primary. During an exclusive interview with ABC News' Jonathan Karl for "This Week," Sen. Ted Cruz, R-Texas, called Sen. Rand Paul, R-Ky., a friend, but drew a distinction between himself and the Kentucky senator on foreign policy, saying the U.S. "has a responsibility to defend our values." "I'm a big fan of Rand Paul. He and I are good friends. But I don't agree with him on foreign policy," Cruz said. "I think U.S. leadership is critical in the world. And I agree with him that we should be very reluctant to deploy military force abroad. But I think there is a vital role, just as Ronald Reagan did… The United States has a responsibility to defend our values." Cruz also took President Obama to task over Russia's invasion of Crimea, citing the president's "weakness" in dealing with matters of foreign policy as a reason for Russia's seizure of the Ukrainian peninsula. 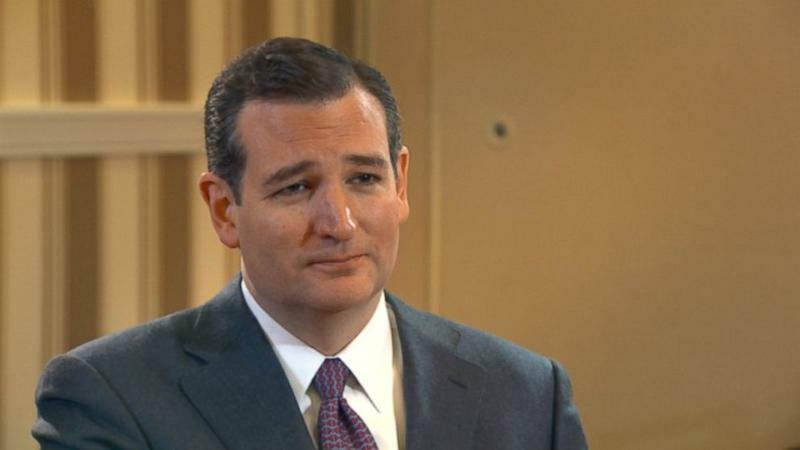 "A critical reason for Putin's aggression has been President Obama's weakness," Cruz told Karl on "This Week." "That Putin fears no retribution… [Obama's] policy has been to alienate and abandon our friends and to coddle and appease our enemies." "You'd better believe Putin sees in Benghazi four Americans are murdered, the first ambassador killed in service since 1979, and nothing happens," Cruz added, echoing comments by other Republicans like Sen. Lindsey Graham, R-S.C. "You'd better believe that Putin sees that in Syria, Obama draws a red line and ignores the red line. You'd better believe that Putin sees all over the world." When asked about Russia's record of aggression before Obama became president, including its invasion of Georgia during the presidency of George W. Bush, Cruz instead slammed Obama for mocking 2012 GOP presidential nominee Mitt Romney for his comments about Russia during the 2012 campaign. "When Mitt Romney talked about Putin expanding his sphere of influence, Obama mocked and said the Cold War has been over 20 years, nothing to be worried about…We keep making that mistake with Putin," he said. "Putin is a KGB thug…When the protests began in Ukraine, the president should have stood unapologetically, emphatically for freedom…When the United States doesn't speak for freedom, tyrants notice." Like "This Week" on Facebook. You can also follow the show on Twitter. Check out what time "This Week" airs in your area.